A finely crafted collection of jewelry and keepsakes. 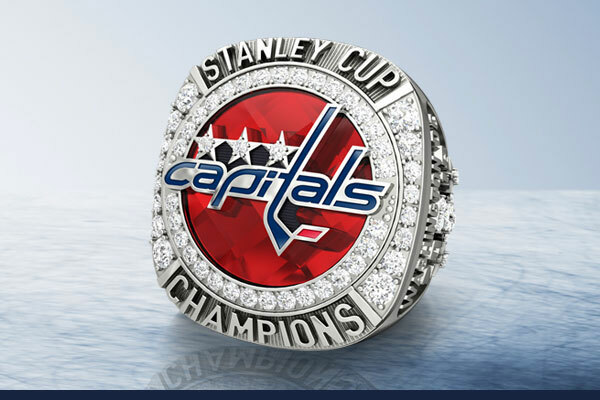 Made just for the monumental fans of the Washington Capitals. 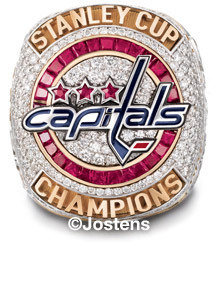 The Washington Capitals 2018 Stanley Cup Championship Ring beautifully commemorates the team's historic 2017 - 2018 championship season. 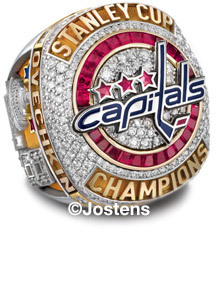 Crafted in 14-karat white and yellow gold, and expertly set with diamonds, genuine rubies, and a genuine blue sapphire, it's nothing short of a monument to excellence - a fitting prize in honor of the franchise's first-ever Stanley Cup Championship. The ring top features 157 pavé-set round diamonds in a cascading waterfall effect. 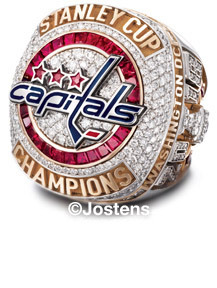 An additional 27 diamonds surround the Washington Capitals logo, which is made of blue and red color enamel. Atop the wordmark, CAPITALS, are three custom-cut star-shaped rubies, inspired by the Washington DC flag and help represent the team's strong ties to DC, Maryland and Virginia. Encircling the logo are 28 custom taper-cut rubies. Surrounding the top prominently is the team's awarded title, STANLEY CUP CHAMPIONS. Dual rows of channel-set princess-cut diamonds accent the top and bottom of the ring top, each row containing 11 diamonds, making for a total of 22. 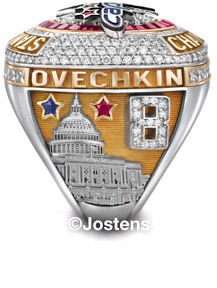 The right side of the ring features the championship year date 2018 with 26 diamonds and a replica of the Stanley Cup is set with 20 diamonds. 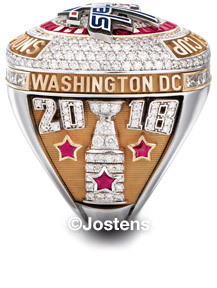 Two custom-cut star-shaped rubies stand alongside the Stanley Cup and represent the team's two Eastern Conference championships. A third custom ruby sits atop the trophy, representing the 2018 Stanley Cup victory. The words, WASHINGTON DC, appear above it all, paying homage to the home base of the franchise and the extraordinary privilege of honoring the nation's capital. The left side of the ring features the United States Capitol Building with incredibly intricate detail. To the right is the player number, expertly set in diamonds. Also featured on the right side is a custom-cut, star-shaped sapphire, and a custom-cut, star-shaped ruby, which surround the Capitol building dome. 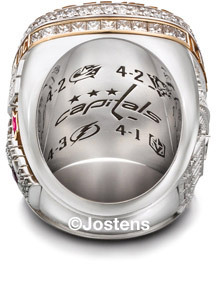 The ring interior features a specialty arbor with the Capitals logo, along with the logos and series scores of the teams they defeated along the way to making history as Stanley Cup Champions for the very first time. The ring features an average of 230 round diamonds, as well as 22 princess-cut diamonds, for a carat weight of 5.5 carats. Increasing the stone count are 28 custom taper-cut rubies and seven custom-cut star-shaped rubies, totaling 4.6 carats. A star-shaped sapphire weighing .10 carats brings the precious stone carat weight to an incredible total of 10.2 carats.